Hungry Sumo from Ninja Kiwi is a fun arcade game with a simple concept – feed your sumo to crush the others! This flash game turned app is easy to play and combines several other successful concepts used by other apps that help make it so enjoyable. To begin with you are instructed to feed your sumo by holding your finger on him as he moves across the screen like a big balloon. As your finger rests on him, sumo will automatically start scooping rice into his mouth with his tiny chop sticks. Just don’t let him bump an enemy as he is eating or he will pop and you will have to start again. When your sumo does encounter a floating villain he will be bumped down a size each time, until he turns into one of them. 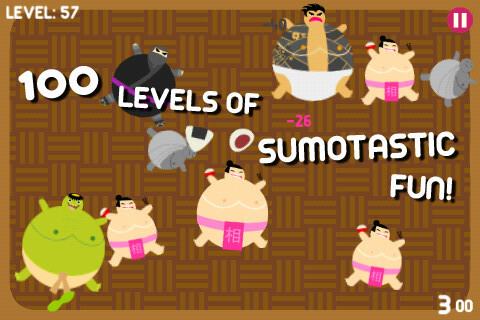 As levels progress you will have more and more sumo to feed and enemies to battle. Remember, size is key in defeating them, but so is timing. There are also power ups that can be earned by eating sushi as it appears on screen. Different sumo villains will have different rules to play by, so crushing them is not always easy, including ghostly sumo and sumo engulfed in flame! Ouch! What Hungry Sumo definitely has going for it is the replay value. In between different levels are mini games that are just for fun. Some in the fashion of “Plinko”, the famous game show game. Others in more recent homages like Fruit Ninja, but in this case it is the ninjas that are the subject of the comical slashing. All the mini games surround the theme of the sumo and his eating and are a short and fun break-up from the levels becoming too repetitive. Though the graphics aren’t anything to brag about and the sound design is a very typical Asian like theme, it all adds to the comical nature of the game as it is anything but serious. The multi-touch controls are easy to learn but also increase difficulty as sumo characters are added into the more challenging levels. There are over 100 levels and 4 different mini games, which can also be played by themselves from the main menu. Ninja Kiwi has made an addicting app that is just plain fun. Hungry Sumo is universal for iPhone and iPad and is currently at the awesome price of $.99 in the app store.